Here are some of the products I have being loving this summer. It has being extremely hot in Holland which is very nice but not so nice for the skin. I see the pigmentation come up on my skin which I didn’t have before. I think I have all my previous sun baking years and living in Oz to thank for that. It takes 10 years+ for sun damage like hyper pigmentation to show on the surface of the skin. My go to skin routine this summer has been Vitamin C & Antioxidant serum and SPF30. Weekly I have being using eye masks and sheet masks to help hydrate the skin. I have being doing a gentle exfoliation, nothing over the top because of the weather and I hope you know, exfoliation sensitizes the skin from the sun so it can cause more damage. So if you take a look at the picture above, I will explain what I have being using and loving. · Mario Badescu facial spray with rose water and aloe vera – This is facial spray to help hydrate the skin throughout the day and act as a toner. I love these to freshen up throughout the day especially in this hot weather. · Avoyd Ingrown hair lotion with alpha hydroxy acids – THE BEST THING I HAVE EVER USED! I have keratosis pilaris on my arms (rough bumpy red skin) and this helps to soften the skin and lessens the appearance of the bumps and redness. I started to use on my legs now for ingrown hairs and its really working. It takes at least 1-2 weeks to see a difference. · Dermaroller – I didn’t use this a whole lot this summer but every 10 days or so to help penetrate the vitamin C and Hyaluronic acid into my skin. · Murad SPF30 Vitamin C – I am loving this spf because it is light feeling and doesn’t leave you with the white look. I bought it for the vitamin C though, as its an important ingredient in the skin and especially in summer. · Weleda Skin food – This is my go to product all year round. 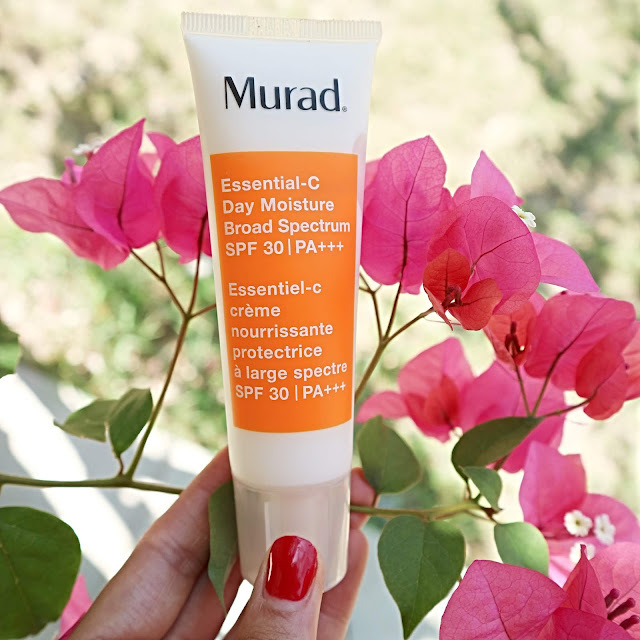 It is probably too heavy as a night cream in the summer, especially with how hot it has been here but after all the sun exposure I have applied it to my skin every now and then as an extra dose of vitamins. Helping recover the skin. · Image Vitamin C serum -I was very very impressed with this vitamin C serum. I have tried Image skincare in the past and my first impressions weren’t all that great. However If I think back to that time, my skin was not used to cosmeceutical products at all. But now having used a lot of different vitamin C serums from a variety of cosmeceutical brands this one has left me with the feeling of very glowy, bright, smooth skin. · Environ AVST 4 – Vitamin A moisturiser with peptides and antioxidants. This has been helping my skin glow and stay smooth throughout the summer. During the winter I do have to add another moisturiser in the PM on top of this as my natural dry skin needs a little more. · Environ Avance Elixir– repairing and boosting serum to help even the skin tone. I have been using this serum specifically after derma rolling so that the ingredients get as deep as possible into my skin. · Primark Massager – Roller massager I have been using once or twice a week to help massage the muscles in my face. Massage helps with lifing and firming the skin. Good for lymphatic drainage and circulation too. 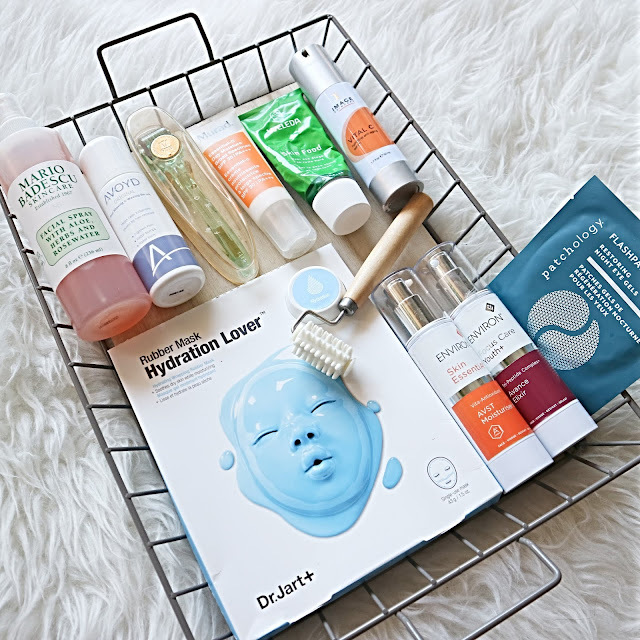 · Sheet Masks – Dr Jart + Face mask for hydration, and Pathology eye masks hydrating and plumping. Sheet masks can be used daily or weekly all year round.